TemplateHack.com - Download Gridify premium blogger template. 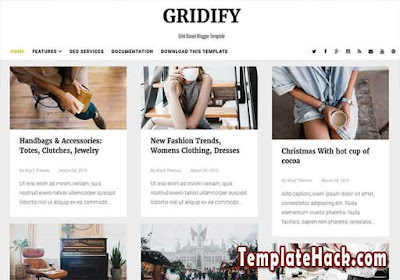 Gridify is no sidebar blogger template and suitable for any magazine blogspot topic. It will be great to install on your lifestyle blog, food blog, travel blog, design blog and photography blog. To get this free premium blogger template and all of great features inside, just download by click the download button. If you want to see demo version first, click the demo button below. Enjoy this blogger com template. Ads Ready, Breadcrumbs, Browser Compatibility, Drop Down Menu, Fast Loading, HTML5 Valid, Mobile Friendly, Post Thumbnails, Responsive, SEO Friendly, Social Bookmark Ready, Whatsapp Sharing Button, Elegant, Minimalist, No Right Sidebar, white, 3 Columns, No Column Footer. Adapted From Wordpress blogger template, Beauty blogger template, Daily Blog blogger template, Entertainment blogger template, Fashion blogger template, Food blogger template, Gallery blogger template, Health blogger template, Lifestyle blogger template, Magazine blogger template, News blogger template, Newspaper blogger template, Personal blogger template, Photo blogger template, Photography blogger template, Portal blogger template, Recipes blogger template, Technology blogger template, Wordpress Look blogger template.